This headline comment, or something similar, is regularly heard on the golf course and provides a good starting point for this week’s blog. For a ball to be lost in a water hazard (which includes a lateral water hazard) it must be known or virtually certain that it has come to rest within its margins. A player may not assume that their ball is in the water hazard simply because it cannot be found in the vicinity and so there is a possibility that the ball may be in the water hazard. In the absence of knowledge or virtual certainty that the ball lies in a water hazard, a ball that cannot be found must be considered lost somewhere other than in the hazard and the player must proceed under Rule 27-1, by returning to where their last stroke was made from under penalty of stroke and distance. 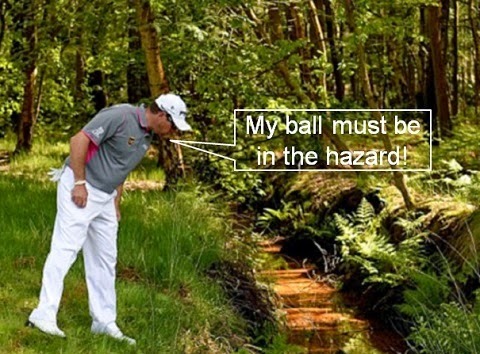 To put this into perspective, if players are searching for a ball outside a water hazard, e.g. in long grasses, bushes or trees adjacent to the hazard, then logically they must have thought that there was a good chance that the ball may be at rest outside of the hazard. Unless a ball has been seen to splash into water from a height, with no chance of it bouncing across the surface, ‘dambusters’ style, onto the other bank, or can be seen to lie at rest within the margin, then there is at least a possibility that it may not have come to rest in the hazard. An example of a rare situation where it may be assumed that a ball is lost in a water hazard is if it has been struck down a fairway with a ditch running across it, marked as a water hazard, and the ball cannot be found on either side of the ditch near the line of flight. In this case, where there is virtually no possibility that the ball could be lost outside of the hazard, the player may take relief from the hazard by choosing one of the three relief options under Rule 26-1, for a penalty of one stroke. Even in this situation, if there are many fallen leaves lying on the fairway then the strict, known or virtually certain requirement may still not be satisfied. To summarise, a player may not assume that their ball is lost in a water hazard unless it is known or virtually certain that the ball could not have come to rest anywhere outside of the margin of a hazard. If it cannot be found the ball must be treated as lost. Don’t sign your score card until…. So, the very last thing that a player should do before returning their score card to the Committee is to sign it, formerly attesting its accuracy and completeness. This was a hard lesson learned for 23 year-old English professional, Holly Clyburn, at the LPGA Qualifying School two weeks ago, when she was disqualified, due to her marker leaving the scoring area without signing her card. Holly checked and signed her score card and had it verified by the officials in the scoring tent, but neglected to ensure that her marker had also signed it. When the officials realised that the marker’s signature was missing they had no option other than to disqualify Holly Clyburn for her breach, Rule 6-6b. So, the lesson is, do not sign your score card before your round, during your round, even immediately after your round. Wait until you are in the designated scoring area, check that your marker has entered all your gross scores correctly, and has signed the card, check that your full 18-hole handicap has been entered correctly and then sign it and return it to the Committee as required for the competition (e.g. by depositing it in the competition box). Finally, I recommend an interesting article by European Tour Chief Referee, John Paramor, on his experiences at last month’s Ryder Cup in Gleneagles. Click on this link. For a ball to be lost in a water hazard it must be known or virtually certain that it has come to rest within its margins. Could you expand therefore on whether you would be permitted to play a provisional ball if there was only a "possibility" that the ball had entered the water hazard. The rules suggest not. If there is only a possibility that a ball may have come to rest in a water hazard, then logically there must be a possibility that it may not. Rule 25-2 permits a player to play a provisional ball if a ball may be lost outside a water hazard.